If you’ve been watching Channel 4 lately you can’t have missed the deluge of food programmes that they launched at us with a view to raising awareness and encouraging debate about food production, animal welfare and healthy eating. The strongest point of attack in the Big Food Fight was on intensive poultry production with both Jamie Oliver and Hugh Fearnley-Whittingstall rounding the guns on battery egg production and industrial chicken rearing practices. I found Jamie Oliver’s conclusions particularly pragmatic and felt that they showed some understanding of the plight of the farmer. His basic plea to consumers was to pay for as much welfare as they feel they can afford. He urged leadership on the part of supermarkets and regulators to ensure not just urgent action but that the costs are not all lumped on farmers, who have to take the price they are given. If change is too swift then it will destroy the production base and we’ll end up relying on imports. That said battery egg production in particular looked awful, half a dozen birds crammed into a tiny cage with no floor just wire. Their beautiful red feathers are gradually shorn from their necks, wings and backs by the wire until after 10 months of laying an egg a day they are pulled out half bald and sent for pulping. They can do nothing but eat, drink and lay eggs – nothing that could constitute the “freedom to express normal behaviour”, which is one of the five freedoms in animal welfare. Having ably demonstrated some of the more distasteful and cruel practices employed in poultry farming Jamie confronted both industry representatives and the supermarket chains to get a response. Essentially change is coming, battery cages as we know them now will be outlawed by the EU in 2012, what will replace them is unclear, most likely some kind of “enriched” cage, with perches and a scratching area. However, some of the supermarkets will have removed battery eggs from their shelves well before then – Waitrose and Sainsbury’s in particular giving assurances of urgent action to Mr Oliver. Having watched Jamie’s Fowl Dinners I was more convinced than ever, but I was still a bit unsure about what exactly free range means, he was a bit light on details in this regard. In the back of my head are comments how there’s free range and free free range, which presumably means the real diehards are still driving to a woman out the country and bringing their own cartons. Should I be doing this too I wondered? So this week I paid a visit to James and Mary O’Brien at Valleyview Free Range Eggs in Bandon. 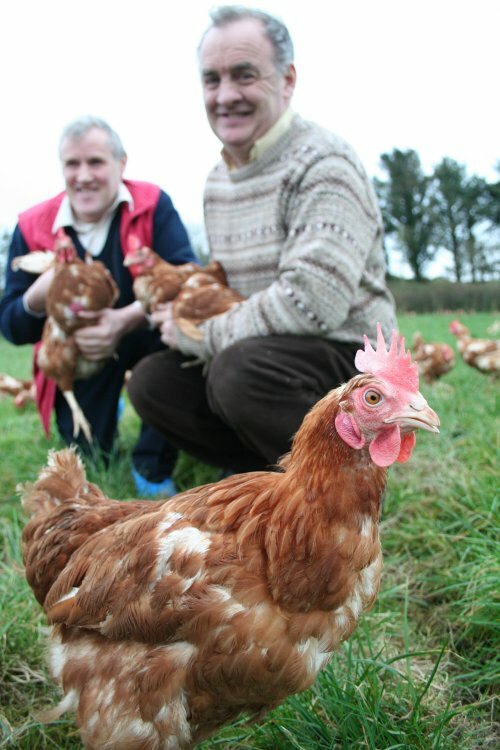 James and Mary established their business producing and selling free range eggs in 1985 with just 200 birds. When they started up free range was a tiny niche in the egg market and it was a struggle to get the supermarkets to stock them. There was relatively little interest in and value on bird welfare and paying a premium for eggs was generally considered an expensive luxury. By contrast my local Supervalu now has over 60% of its egg space devoted to free range – a good indication of market share. Sadly, I know that this is not the full story as it ignores eggs used in ingredients and restaurants, most of which are from battery hens and most of which sneaks under the radar of conscience. In fact 68% of laying hens in Ireland are still kept in battery systems. So what does free range mean anyway and should we really be looking for “free” free range? Well, to further my education James took me to one of his suppliers – Declan Walsh near Ballinascarthy. Declan keeps 4,000 free range hens a typical sized unit for Irish producers nowadays and operates under the Bord Bia Quality Assurance Scheme. In the UK 18,000 would be considered average. The Irish regulations state that hens must have continuous day time access to open-air runs on ground which is mainly covered with vegetation. The maximum stocking density is not greater than 1,000 hens per hectare of ground available to the hens and the land must be dedicated to the free range flock, so no other animals can graze it. The hens must be accommodated in a well constructed insulated house with a floor space of one square metre per seven birds. The hens on Declan’s farm were in great form – the temporary lift in the weather surely helping. They were outside picking around in the grass and scratching for whatever it is that so obsesses them. There appeared to be plenty of social interaction and both their feathers and curiosity were well intact. James told me that as a farm enterprise, free range egg production stacks up pretty well. He currently has 4 West Cork farmers supplying him and he is always ready to take on new local suppliers. The return on an initial investment of between €250,000 and €500,000 compares favorably with other land use options. So what of the woman out the country and free free range? What also of the unstamped eggs sold at markets or in small shops? Well, all I can say is that if you’re sure of what you’re getting then you don’t need me telling you anything. But if you’re not sure, then could you be getting repacked eggs that are not free range at all? I have looked at what the Bord Bia Quality Assurance definition of free range is and I am satisfied that this is a tight system with excellent traceability and welfare regulations that are high by international standards. There may be other definitions of hen heaven but if like me you’re buying well down the food distribution chain then regulation and supervision is needed. And if good farmers are going to have a chance of making a living whilst maintaining decent welfare then there needs to be a level playing field where you get what it says on the carton. My name is Katy Lucey from Gougane Barra Hotel, I would love to get yer free-range eggs. Could ye send me a price list and possible dellivery options.Nan O Donovan calls here with cheese and said she could collect possibly? Hello, is it possible to visit these poutry farms to see how free range they actually are?